My husband and I have an annual competition trying to see who can guess the most correct films that will win Academy Awards each year. Lately we have been madly catching up on films so we will be better prepared for the Oscars on the 28th of February. 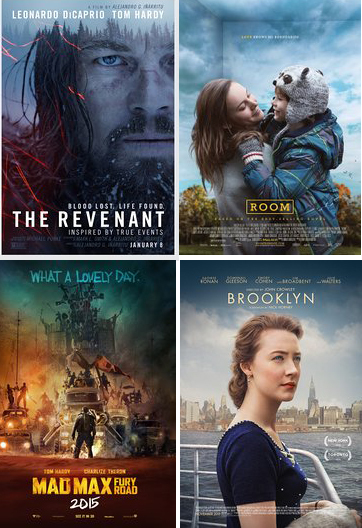 So far my top picks for best picture are The Revenant (shocking, brutal but excellent), Room (disturbing, sad, hopeful) Mad Max (brilliant action film featuring strong women) and Brooklyn (gorgeous love story). I think in the end The Revenant should win best picture. Other films worthwhile seeing, 45 Years, Trumbo and The Danish Girl. I think the best actor award will go to DiCaprio for the Revenant. Best actress is a closer race but I think Brie Larson will walk away with it from Room. I wish that the child from Room was nominated for supporting actor. He was brilliant. Best director, I would have said The Revenant, but if it gets best picture it won’t win both, so I’m picking Room. Best supporting actress Alicia Vikander from The Danish Girl. Best supporting actor either Tom Hardy from The Revenant or Christian Bale from The Big Short. Films I didn’t care for were Joy and Creed. If you liked the first what…20 Rocky movies you’ll probably like this because it is simply another Rocky movie. I was bored to tears in Carol. I’m sorry. Despite the amazing vintage clothing and decor I didn’t like either of the characters and found the whole film to be stiff, and painfully slow. I did watch The Hateful Eight and although it was watchable it isn’t my favourite. If you like Tarantino movies you’ll probably like it. Too much blood and gore for me. Have you seen any of the movies nominated this year? What was your favourite? I really appreciate this because I am so behind on my Oscar movies. Usually we spend January and February going to see all the movies and make our predictions. I really want to see The Revenant. I love Leo, of course, but even from the previews, it seems like an intense, highly sensory film. I haven’t heard anything about Brooklyn, but now that one is at the top of my list as well. I’m in the mood for a “gorgeous love story”! I think you will love Brooklyn. My husband really enjoyed it as well. Sooo much more in the loop than us. But then again we don’t have a tv to watch the Oscars so moot point! Have you worked out your Oscars watching outfit? Thanks for your thoughts. Every year I have this conversation with my film-buddies. Some years I have an Oscar party and hand out voting-ballots; the winner gets a prize. There’s often a big difference between who wins and who should win. Many great performances aren’t even nominated. I mean, how can you ignore Charlize Theron in “Mad Max”? P.S., Thanks for the interesting question you left on my blog. I answered it. Yikes, I am way behind on my current movie watching. I’ve been addicted to streaming classic films lately and have not ventured out much to the movie theater. But I did see “The Martian” with Matt Damon. It was brilliant, so I am predicting it wins something, at least best director. Even though Matt was great, he’s not going to beat out Leo for best actor. Look forward to your outfit post day after Oscars! I haven’t seen a single one, sadly. My guys saw The Revenant and loved it. They say this is Leo’s year – we’ll see! The only movie I’ve seen is Revenant. It was an interesting movie but I struggled through it. I will have to see the other ones. Par and I do the same thing, well actually we get together as a huge extended family and cast in our votes. We’re all pretty avid movie goers so it’s quite am eventful evening. With that being said, we’ve seen them all and my vote would go to the Revenant as well, it was exceptional and DiCaprio was beyond superb. I agree with you on your votes from room as well. I haven’t seen or heard of these movies and I don’t watch the Oscars but I think Leo is hot and a great actor so… anything with him it wins the Hollie Award. Sad to say that I saw none of them yet:-(. However, good call on most of your guesses! Hope you had fun watching the show.